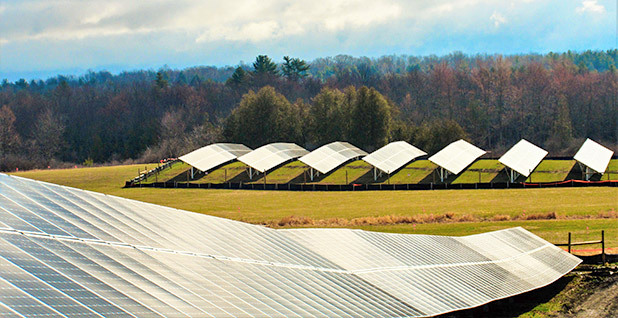 The Sudbury solar project in Vermont was built by Allco Renewable Energy. Allco Renewable Energy Ltd. Fully powering the electric grid with renewable energy — a popular goal for environmentalists — isn't the cheapest way to a zero-carbon system, Massachusetts Institute of Technology researchers say in a paper published today. The best way to eliminate emissions from electricity generation is through a balanced mix of low-carbon sources, pairing wind, solar and batteries with one or more "firm" carbon-free resources like nuclear power, geothermal energy, bioenergy or natural gas with carbon capture, according to the article in the journal Joule. "You can play basketball with a team consisting solely of point guards. You can even put a few points on the board. But you're going to lose each time to a team with the right mix of star players filling out the full squad of forwards, guards and centers," co-author Jesse Jenkins said in an email. Wind, solar and batteries can drive down emissions over the next decade, he said, but "filling out the team and winning the deep decarbonization game means keeping policies flexible and focused on ends (eliminating CO2) rather than specific means." The researchers modeled more than 900 cases to account for differences in carbon limits, technological uncertainty and geographic differences and found "firm low-carbon" technologies reduce electricity costs by 10 to 62 percent. The alternative is completing a daunting list of technological upgrades, wrote Jenkins and fellow researchers Nestor Sepulveda, Fernando de Sisternes and Richard Lester. "We find that in the absence of firm low-carbon resources, affordable decarbonization of the power sector would simultaneously require further steep reductions in the cost of [variable renewable energy] and battery energy storage technologies, significantly oversizing installed capacity relative to peak demand, significantly greater demand flexibility, and expansion of long-distance transmission capacity connecting wide geographic regions," they wrote. The paper also calls for updating the terminology used to describe generation sources, which have in the past been largely classified based on the frequency with which they are called upon to meet demand. To replace phrases like "baseload" and "load-following," the authors suggest calling renewable resources like wind and solar "fuel-saving"; referring to batteries and demand response as "fast-burst" balancing resources; and qualifying more flexible resources like nuclear, coal and natural gas as "firm." The new research came out days after California's Legislature passed S.B. 100, which shifts the state's electricity policy from a renewable-specific mandate to a more flexible 100 percent carbon-free goal. Jenkins praised that policy as well as Massachusetts' "clean energy standard." Significant challenges remain in the deployment of firm low-carbon resources: The use of both nuclear power and carbon capture lags climate targets set by the Intergovernmental Panel on Climate Change in 2014, the use of biomass for energy competes with other land uses, and other "firm" low-carbon resources like geothermal energy and reservoir hydropower work well only under certain geographical conditions. But advancing those technologies is a goal worth pursuing aggressively, the paper argues. "It is important to heed these findings today, because decisions made now about power plant construction, research investments or climate policies have impacts that can last for decades," Jenkins said. "If we don't start now to overcome the economic, technical or social barriers preventing wider adoption of nuclear, CCS, enhanced geothermal or bioenergy, these firm resources will not be available and affordable when we need them to contribute to a zero carbon grid," he said.